Nidays Microgreens is open at the Saturday Fayette County Farmers’ Market. It is amazing how much difference a week can make in what happens around us; we move through our daily routines and suddenly notice that something has shifted significantly. For me, this week signaled the sighting, in a single day, of three hummingbird moths (how do I know they weren’t the same ones? I can’t be sure, but I did see two at the same time on the same bush), all on the bee balm that had just bloomed. The shift for Fayette County Farmers’ Market attendees was that the much awaited Donut truck arrived last Saturday — the line that formed throughout the morning signaled the appreciation of the community. Market shoppers, who are “buying local” and in season, will notice that some of the “spring crops” such as beets and broccoli are available – it will be a brief time! – at the same time as the beginning of “summer crop” green beans, summer squash and cucumbers. What a bounty, made richer by the recent rain and slightly cooler temperatures. When each type of produce comes available, many no doubt indulge in that dish that is a perennial favorite….perhaps a cucumber and onion vinegar salad, or green beans with small potatoes and butter, or zucchini boats with a meat filling. But there are times when our garden over floweth or the CSA (community supported agriculture) basket holds the vegetable AGAIN for which we have run out of ideas for fixing in interesting ways. Or maybe we know we “need” to eat more of a certain vegetable, but haven’t found it particularly appealing. This is our opportunity to turn cooking and eating into a joyful adventure. I turn to some of my favorite cook books. You don’t need to be a vegetarian to enjoy cook books that focus on vegetable and harvest preparation. Of course, many people use the internet now to search for recipes, freeing up book shelf space. What ever your preferences, look for recipes that fit your interests for ease of preparation, number of ingredients required, adaptability, and time involved. Many vegetables are adapted to roasting, either in an oven or outside (ah! No extra heat in the house) on the grill. And the vegetables can be mixed and matched, factoring time needed to cook. Beets take about 50 minutes in the oven, but less time the smaller they are cut. Green beans only take about 15 minutes, and summer squash (aka zucchini) about the same. New potatoes, broccoli and cauliflower require some amount of time in-between these extremes. Almost any vegetable may be tossed in olive oil and roasted. Course salt or a spice of choice (think sage or paprika or tumeric) adds complexity. Andrea Chesman offers up recipes for dressings that would be fabulous as a dip for roasted vegetable; check out her book “Serving up the Harvest” and her recipes for tahini dressing and mustard crème fraiche (with horseradish); just the thought of mustard, cream and horseradish is making someone’s mouth water. B.Y.E. Gardens (Brian and Elaine Yoder): Tomatoes, zucchini, yellow squash, blueberries, small pies, peanut butter cookies, butterscotch cookies, lemon rolls, raspberry rolls, cinnamon rolls, sweet breads, orange Julius bread. Chilcote Farm (Bruce & Marlene Chilcote): Honey, ooey gooey cinnamon cake, butter pecan cake, white sheet cake, cookies, bees wax wraps. Greens & Greenery (Katrina Bush): Seasonal produce grown with out any chemicals: cucumbers, garlic, green beans, kale. Egyptian walking onion starts. Plants: Herbs, including basil and lemon grass; flowering perennials (echinacea, blanket flower, bee balm, milkweed) Beeswax body care products. Gingersnaps and baklava. Jones Farm Fresh Produce (Jon & Taylor Jones): Fresh garlic, garlic scapes, green beans, red potatoes, candy onions, zucchini, yellow squash, cabbage, beets, tomatoes, cucumbers, South Carolina peaches, chicken breast, wings, chicken patties, chorizo chicken brats, pork chops, sweet Italian and jalapeño brats, maple links, ground pork, bulk sausage, sausage patties, ground beef, hamburger patties and brown eggs. King Farms (Jeff & Sandi King): Broccoli, cabbage, yellow squash, zucchini, onions, banana peppers, green peppers, cucumbers, homemade pies (peach, cherry), banana and zucchini bread, candy and homemade dog treats. Nidays Microgreens (Victor Niday): Micro-greens of basic salad mix, broccoli and kalrabi. Persinger Cottage Foods (David Persinger and Julie Mosny): The Pie Lady will have pies: blackberry, cherry, black raspberry, apple, strawberry rhubarb; also cinni mini’s, cinnamon rolls, oatmeal raisin cookies. The Jam Man will have jams, jellies, peach butter. 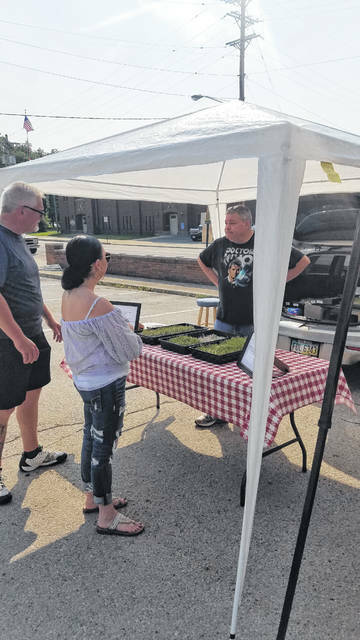 https://www.recordherald.com/wp-content/uploads/sites/27/2018/06/web1_Nidays-Microgreens.jpgNidays Microgreens is open at the Saturday Fayette County Farmers’ Market.